Created with 100 percent Agave 1800 Silver Tequila and perfectly blended with the flavor of fresh peaches for a refreshing crisp bite and tangy finish. 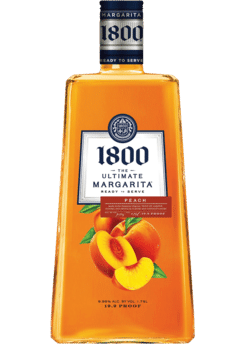 The 1800 Ultimate RTD Margarita is one of the fastest growing ready-to-drink brands on the market, and is one of the few 100 percent agave tequila-based RTD's on the market. 1800 Silver Tequila is already present in the 19.9 proof mix, taking away the hassle of measuring and mixing, and making the ease of portability and clean up the perfect choice for party goers this season.